Melissa Mar is known to young adult readers as the author of the popular faery series Wicked Lovely. Her debut leap into adult fiction lands her in the small community of Claysville, a town where the dead walk free unless there their graves are not properly tended. Into this eerie maelstrom, Rebekkah Barrow descends as she returns to a place that she once believed she knew. Kelley Armstrong justly described Graveminder as "a deliciously creepy tale that is as skillfully wrought as it is spellbindingly imagined." A new genre author to watch. I'd like to say that I've read everything by Melissa Marr. I'd like to say that. However the truth is that until Graveminder showed up at my door, and drew me in with it's Southern Gothic cover and blurb, I hadn't realized Melissa Marr's books were out there. Shame on me, I know. Let's just say that I've remedied that now, and if Graveminder is any indication of Marr's shining talent, then I'm 100% in. Call me a fangirl. 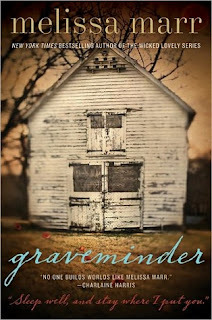 Graveminder is deep, gritty and filled with the type of tension that you only see in really good, old, horror movies. You know, the ones where the town seems peaceful and quiet at first glance, but deep down you know there's something brewing under the surface. The small town feel allows the reader to watch characters interact who know one another so intimately that it is captivating. I believe it's on the front cover that Charlaine Harris mentions Melissa Marr's stunning world building abilities. I second that, third it, and go back to read this book another time through. Claysville is not only a town populated by some of the most intriguing characters I've ever met. It's not just a town that buries secrets. No, Claysville literally breathes. It's alive. If the town itself is alive, the characters are even more so. Their lives bleed off the page, intermingling into a group of people you might just meet some day. I fell in step with Rebekkah and Byron almost instantly, watching as their paths widened, met, and finally tangled into a messy heap. Each of them was believable, and I enjoyed that Marr didn't try make them perfect. Rebekkah and Byron each have their own demons that they are fighting, even as they are trying to keep one another from drowning. The tension between them, both in terms of anger and sexual interest, is palpable. I couldn't get over the fact that they were thrown together so unceremoniously. Following them as they tried to sort things out, and learned to rely on one another, was definitely a big part of what kept me reading on. There's not really too much I can share with you in terms of the story line, without spoiling things. I am enamored with how little the synopsis gives the reader in terms of back story. To be honest, the less you know going in the more you'll be open to falling in love with the concept. This isn't your typical zombie book my friends. I'm honestly not even sure it should be compared to that. What Marr has created in Graveminder is something new, fresh and beautifully original. Her characters, her setting, the gorgeously woven story, it all comes together to create one heck of a book. Grab a copy and dive into Claysville. You might find that you just can't leave.